By Hekuran Mara – professor, economist, specialist in theoretical and practical problems of socialist economy. This article discusses the necessity of transforming Albania into an industrial-agricultural country, the way of defining the economic features of a country and the role of heavy industry and agriculture in the profound economic transformation of the country. The building of socialist society passes through stages, from lower forms to higher forms of social organisation. These stages are defined by the level reached in the development of the productive forces and the relations of production. They cannot be eliminated or bypassed in an arbitrary way. The stage reached in economic and politico-social development has brought our country into the stage of the full construction of the socialist society. This stage represents a more or less long historical period in itself. It has raised before our Party new theoretical and practical problems of socialist construction in all fields of life. With the entry into this stage, new experience of economic, social, ideological and cultural organization, management and development is being accumulated. A complex representation of the complete socialist society is also being worked out, which brings in new concepts relating to both the base and superstructure, the material and spiritual development of the society. In the many-sided and complex totality of the economic, ideological and social problems to be dealt with in the complete construction of the socialist society, the chief task is the completion of the material-technical base of socialism, the securing of the all-round, harmonious development of the productive forces at a high rate. This derives from the Marxist-Leninist thesis, according to which the development of the productive forces constitutes the decisive factor for the progress of any society, and therefore also for the creation of those conditions which are required for the full construction of the socialist society, and later on of the communist society. The reasons for pursuing a policy which aims at such an objective have been stated and substantiated by the Party. Let us recall here some of the principal ones. 1. – First of all, the full construction of the socialist society necessarily requires a complex economic development of the country. This is needed in order to increase the degree of independence of the economy, to strengthen unceasingly the socialist politico-social order, to raise the material and cultural standards of the people, to narrow the essential differences between the countryside and the town and to increase the country's defence capacity. All these vitally important tasks cannot be fulfilled without having a diversified developed economy with industry, agriculture, building-trade, transport, social services, etc. The basis of all these branches, the most important factor for their maintenance and development, is industry. 2. – Another reason is that the People's Republic of Albania was born, is living and carrying forward the socialist revolution in a continuing situation of hostile geographical and strategic encirclement. This encirclement and the difficulties it creates have not been desired by the Albanian people, but were imposed on them by history. Under these conditions our Party and our whole people have felt and experienced, have become convinced in life, in every forward stride they have made, that the preservation of the political independence they have gained, the determination and the struggle for socialism and the defence of the country, must necessarily be reinforced with economic progress, with the development of the economy. This circumstance has placed and continues to place a sole alternative before our country; to make all efforts, to use all means and resources in order to secure through our own forces the most vital, and most essential things for the building of socialism. It is self-explanatory that this task cannot be fulfilled if we have only a one-sided economy, without ensuring in the first place the development of industry. To avoid any misunderstanding, we should stress that the guaranteeing and strengthening of economic independence is not a tendency to national self-sufficiency, to produce at home everything the economy and the people need. Nor does it lead to self-isolation, as the revisionists and the ideologists of the bourgeoisie claim/ but on the contrary, it creates greater possibilities to extend economic exchange with the outside world. 3. – The population of our country is continually increasing. The opening of new places of work and the provision of employment for all those reaching working age constitutes a permanent task of socialist construction. And this task cannot be solved without having a complex economy and in particular a developed industry. Only on this basis can the number of people in employment be increased, both in the sphere of production and in that of the service trades and other non-productive sectors. A true socialist country can neither seek nor accept, as the solution to the task of employing the active population, the opening to men and women of the road of emigration to the capitalist world. 4. – However generous nature may have shown itself in providing a country with riches, these are only potential riches. They must be discovered and worked in order to be placed at the service of men and society, for their use. We would point out in passing that our country has many natural riches. The present known volume of the industrial reserves of minerals which are extracted as well as the geological estimates of them, convince us that the extraction of these minerals in the future will certainly increase. In the long term, we do not exclude the possibility of discovering other useful minerals. The fuel and power resources are also sufficient to fulfil the needs of the development of the people's economy for a long period of time. All these factors make it necessary and possible to set up and develop a diversified industry in our country. 5. – The full construction of the socialist society necessarily requires the growth of the leading role of the working class in the whole life of the country, it requires its presence throughout the country as well as the increase of its specific weight in the total number of the population. The accomplishment of this task, which has decisive importance for the destinies of the dictatorship of the proletariat and of socialism, is closely connected with the development of industry, with the raising of the ideo-political, educational and technico-professional level of the working class. Thus, it is evident that Albania's transformation from an agricultural-industrial country into an industrial-agricultural country is not a subjective desire or a circumstantial ambition, but an objective historical tendency. This tendency is being successfully advanced by the Albanian people led by the Party. The achievements scored in this quarter of a century of socialist industrialization are great/ while the prospects ahead are still brighter. The developing countries which embark on the road of socialism, just like Albania when she embarked on this road, have to solve at the same time two closely connected problems – to build up socialism and to overcome the inherited backwardness. The successful and quickest possible solution of these two problems is dependent on the development of industry. The road remaining to be traversed in the socialist industrialization of our country is still a long one. The immediate target of this road is the transformation of Albania into an industrial-agricultural country. In relation to this objective the question arises: To what extent must our industry develop before we can say that Albania has been transformed into an industrial-agricultural country? In order to help in answering this question and with a view to creating the clearest possible understanding of it, we can apply the criteria which are used in determining the economic features of a country. Usually, the economic features (the extent of industrial development) of a country are established by using and harmonizing various economic indices. Among these indices we mention the principal ones: the specific weight of industrial production in the total volume of social production; the specific weight represented by the means of production in the total industrial production; the specific weight represented by various branches in the total volume of the production of the means of production, and, in the first place, the specific weight of the machine-building industry, the specific weight of national incomes created in industry and agriculture; the specific weight of ready-made products, semi-manufactured items and industrial raw materials in the framework of the country's total export, etc. In establishing the economic features of a country great importance is also attached to the indices of industrial production, per capita of the population, of such products as iron, steel, electric power, coal, oil, cement, fabrics, shoes, etc. The level reached by the above-mentioned indices do not as yet allow Albania to be called an industrial-agricultural country at the end of the fifth five-year plan. She is coming very close to this objective which will certainly be reached in the near future. This is explained by the fact that under the fifth five-year plan our industry, besides its quantitative development, will also undergo important qualitative changes relating to the structure of the industrial branches and of production. And it is precisely these changes, accompanied by the increase of the volume of production, which will determine in the final account the transformation of Albania into an industrial-agricultural country. In its Marxist-Leninist policy for the transformation of Albania into an industrial-agricultural country the Party has always aimed at the creation of diversified heavy and light, extractive and manufacturing industries; an industry capable of fulfilling the most urgent and most important needs of the population, of the country's economy and defence. Such an orientation has been and remains fully correct and valid, because it takes account of the country's economic and material possibilities, its riches, the experience gained and sources of work. Within the development of industry priority has always been given to heavy industry, the production of means of production. The creation and development of the heavy manufacturing industry, without neglecting light industry, constitute the decisive stage of our socialist industrialization, and consequently also of the transformation of Albania into an industrial-agricultural country. What are the distinctive features of the five-year plan in this field? The first distinctive feature is that, parallel with the extension of the mineral extracting industry and the fuel industry, under the fifth five-year plan new branches are being created and the existing branches of the heavy manufacturing industry are being expanded. Such are: ferrous metallurgy with a complete cycle; non-ferrous metallurgy (copper and chromium); deep processing of oil; the enrichment of minerals and combustibles, the mechanical and chemical industries. These branches are of decisive importance to the further development of industry and of the whole of the people's economy; they open new prospects to the construction and strengthening of the material-technical base of socialism in our country. The creation of new branches and the extension of the existing branches of the heavy manufacturing industry raise the degree of independence of the economy and strengthen the economic independence of our country, ensuring the production of the things most necessary for reproduction and defence. They prepare the economy to better face any eventuality that may result from the constant political and economic pressure being exerted on our socialist revolution by imperialism and revisionism, that may come because of the geographical and strategic encirclement of our country, or as a result of the disorders and oscillations that occur in the capitalist-revisionist international market. With the setting up of new branches of heavy industry, material-technical possibilities are created for the local processing of mineral and non-mineral raw materials (iron, nickel, cobalt, chromium, copper, oil, gas, phosphorites, salt, etc.). This will further increase the value of these riches and will add to the possibilities for export. In the near future, when the new projects are put into operation, our country will come out in the international market with new industrial products (nickel, cobalt, steel, chemical products, etc) which are in the greatest demand and which will ensure a greater income to the economy. The increase of exports will certainly be accompanied by the increase of the import of those commodities which cannot be produced or which it is not profitable to produce at home, whether they are commodities for reproduction or for wide-scale use. The branches being created under the fifth five-year plan extend the material base to set up new branches of heavy industry and light manufacturing industry. On the basis of ferrous and nonferrous metallurgy the prospect of developing the machine industry, especially the production of machines for various economic branches, is opened up. On the basis of the deep processing of oil, gas and other local raw materials the prospect of developing petrochemistry (the production of synthetic fibres and plastic materials, etc. ), is opened up. The development of the machine-building industry and the chemical industry makes it possible to further invigorate the material base to come to the assistance of agriculture with farm machinery, chemical fertilizers, electric power, building materials, etc. This whole aid will give a fresh boost to the intensification of agriculture, to the approach of the countryside to the town. The same can also be said of the other economic branches. All the above factors arising from the creation of new branches of heavy industry, when taken together, in the final account extend the possibilities for the future increase of production at home and the import from abroad (in exchange with export) of more commodities for wide-scale use. The prospects which the fifth five-year plan opens to the industrialization of our country are great and bright. They bring joy, enthusiasm and inspiration for creative work, for a new revolutionary impetus, to the Albanian workers, cooperativist peasants, intelligentsia, the whole of the Albanian people. At the same time it is of great importance to stress that with the fifth five-year plan the industrialization of our country enters its most important stage. This stage is also accompanied by certain difficulties which characterize it and which are conditioned by the following circumstances. Such modern lodgings are found today in the agricultural cooperatives of a high type. First, during the fifth five-year plan period new big projects of the heavy manufacturing industry will be constructed which, in terms of the volume of construction and assembly work, surpass any project previously constructed in our country. Their construction will require the expenditure of considerable material and financial means, and the construction itself will last for a comparatively long period of time (4-5 years). Within this period the invested means are not in circulation. Under the fifth five-year plan 65-70 per cent of the total sum of the investments earmarked for use in the people's economy will be used in industry. This represents the greatest specific weight of the investments used in industry in comparison with all the previous five-year plans. The overwhelming majority of these investments will be used for the development of heavy industry. Second, the concentration of the principal material and financial means of accumulation in heavy industry limits to a certain extent the possibility of using considerable means at the same time for the development of light industry, agriculture and other branches of economy and service trades. This is a price to be paid for the setting up of heavy industry at a fast pace, an exertion of efforts to be made today for the sake of the future, so that in the future agriculture and the other branches of the economy may develop more speedily and the wellbeing of the labouring masses may increase more rapidly. Third, during the period in which projects of heavy industry are constructed large investments are made while no ready-made production is undertaken. The tens of thousands of workers engaged in the construction of these projects work, receive their pay for the work they do, come to the market and purchase mass consumer goods (foodstuffs and other articles). This cannot fail to create temporarily some difficulties of growth. To overcome them it has been envisaged to increase the production of mass consumer goods at a fast rate. Therefore, the fulfilment and overfulfilment of the production plan for such commodities is of great importance. Every overfulfilment of the plan creates new possibilities to successfully overcome those difficulties which may arise as a result of the accelerated development of heavy industry. 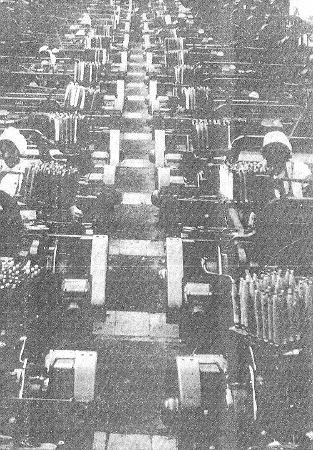 As a result, the increase of the production of mass consumer goods during one year or during the five-year period cannot be used only to cover the existing fund of the wages of the working people, but a considerable part of it will be used to cover the wages of the workers drawn into the construction of the heavy industrial projects. In addition, the construction of new heavy industrial projects gives rise to the necessity of consciously making some reduction in the use of reproduction materials (iron, cement, electric power, etc.) and labour power for the other economic branches (agriculture, construction of dwelling houses, communal services, etc.). For this reason we understand the great importance of the completion of these projects within the set time limit or ahead of schedule, of their construction with the planned investments or with less investments and labour power, by economizing as much as possible. Any shortening of the period of the completion of these projects and putting them into operation will add to our economy production worth millions of leks over and above the plan while any saving in the investments earmarked for their construction will release several millions leks which could be used for the development of the other branches of the economy or of the sphere of services. Any extension of the time limit set for the construction as well as any exceeding of the planned investments creates new problems for the economy, and aggravates the difficulties of growth. The transformation of socialist Albania into an industrial-agricultural country and then, in the more distant future, its aim to be transformed into an industrial country, is an historical tendency. But the other aspect of this question remains equally correct and legitimate: the absolute necessity of our country to also have a developed agriculture. Today the majority of the country's population lives in the countryside and is engaged in farming. In the future the number of the peasant population may decrease. This decrease will not be effected forcibly and spontaneously, according to the model of the capitalist countryside, but it will be conscious, organized and planned according to the interests and needs of the proportional development of the economy, the building of socialism and national defence. The decrease will be conditioned by and depends on such economic and social factors as: the increase of labour productivity and agricultural production, the replacement of labour power with mechanical means, the extension of the sphere of services in the countryside, the employment of the natural increase of the population in the city, the opening of new places of work in the other branches of the economy, etc. Under the above conditions, the economic and social development of the countryside, the growth of its material and cultural wellbeing, and the increase of the incomes of the peasantry, depend in the first place directly on the development of agriculture. The ensuring of foodstuffs for the population, as well as of some raw materials used by the light and food industries, also depends mainly on this development. Agriculture, the countryside, constitutes one of the most important spheres of use for industrial products, for construction and transport. As a consequence, although industry is already playing the leading role in our diversified economy, a role which will become still more accentuated when Albania is transformed into an industrial-agricultural country, agriculture always remains a necessary basis of the people's economy. Therefore, the standing of our economy on both feet, on industry and agriculture, is a permanent and not a temporary task of a given moment or stage of the country's economic and social development. For our agriculture to fulfil its role in the totality of our people's economy as well as possible, it should be continually intensified in the lowlands, in the hills and highlands. For this purpose the Party has worked out in detail an extensive long-range programme which includes the raising of the yields of agricultural crops and of the productivity of livestock; the extension of the arable land area, by opening up virgin lands on hill and mountain slopes, the placing of the whole work of organization and management of agricultural production on a more sound scientific basis. The strengthening of the material and technical base for modern intensive farming, accompanied by the strengthening of the whole socialist order in the countryside, will still further advance the development of the productive forces in agriculture. This will also raise agricultural production to the degree and proportions required by Albania's transformation into an industrial-agricultural country. The task laid down by the 6th Congress of the PLA, of proceeding more rapidly on the road of the transformation of Albania into an industrial-agricultural country, opens a great new prospect to the development of our economy, to the full construction of the socialist society and the increase of the defence capacity of our country. It has aroused enthusiasm in the working class, the peasantry and intelligentsia, and inspires them to new deeds, to tireless creative work, to a new revolutionary impetus. The courage and heroism, the technico-scientific knowledge acquired by our cadres, by our working people, closely inter-related with the correct Marxist-Leninist leadership of our Party, will help to overcome any difficulty that may arise along the road. Therefore, our working people, with great confidence and firm determination, have mobilized themselves everywhere to carry out in practice, fulfil and overfulfil the production plans. Albania's transformation into an industrial-agricultural country will be another great victory, another immortal action of the correct Marxist-Leninist line of the Party in our history of socialist construction. Industry will give a great assistance to the agricultural cooperatives for the strengthening of their material-technical base.